Company Settings are found in the Settings > Setup area. This is where you set your company’s name, logo, and culture preferences (to ensure appropriate date and measurement formats). This is also where you customize your invoice and sales orders to reflect desired payment instructions or other information. In Company Settings you can set all the information like your company’s name and address as well as upload a logo for use with invoices and other reports. You can edit the footer of Tax Invoices and Sales Orders so you customise the payment instructions and do things like add your Romalpa (retention of title) clauses or, indeed, anything you like. 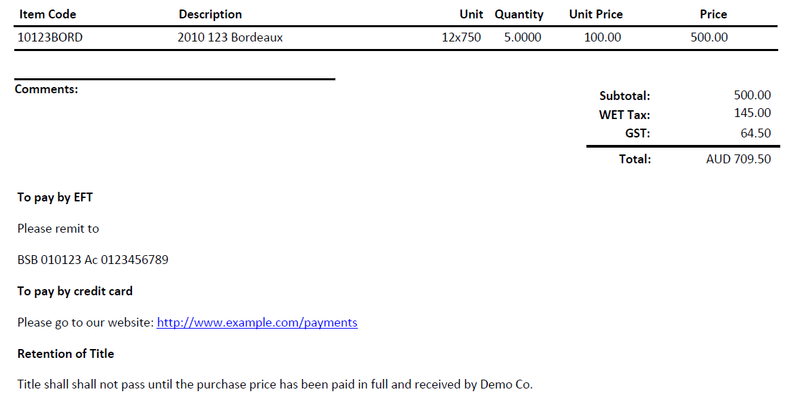 Do this in the Accounting Details area in the Invoice Settings. Be aware that the fonts and alignment may not be the same in the finished pdf so you may need to edit the settings, print a test invoice and repeat a few times until you are happy with it. Settings > Setup area The application respects international weights, measures, date and number formats so it is important you select your language settings correctly as well at the most appropriate default units for volume (eg Litres or Gallons), Length (eg inches or centimetres) and Weight (eg tonnes or tons).